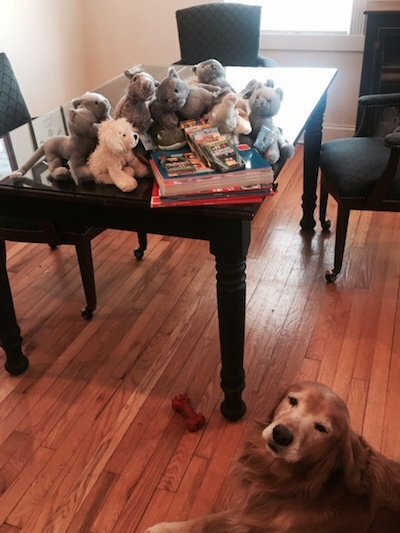 February 2016: Hartsoe Law Firm donated coloring books and stuffed animals to help the children going through the Blount County Juvenile Court system. 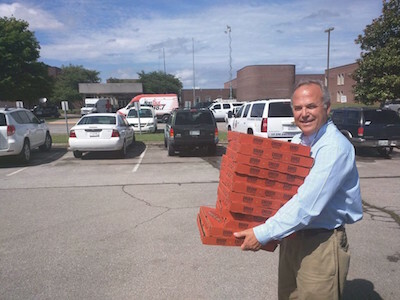 2015: After the July 2015 train derailment in Maryville, Hartsoe Law Firm provided pizzas to their neighbors who had been displaced from their homes. 2015: Hartsoe Law Firm donated the cost for bus transportation for the three Walland Elementary School kindergarten classes to travel to the Knoxville Zoo. 2015: For the third year in a row, Hartsoe Law Firm organized and sponsored “Protect and Paddle” the Little River on September 13, 2015. This fundraiser benefits the Little River Watershed Association. Participants paddle canoes and kayaks for seven miles from Peery’s Mill in Walland to River John’s Island where they enjoy music, lunch and craft beer. Jay Clark and the Tennessee Tree Beavers provided the music this year. Over 125 paddlers joined us for the beautiful float down the Little River. For more information click here. 2015: Hartsoe Law Firm helped the local basketball players in the Blount County by donating basketballs a local elementary school and sponsoring a gymnasium banner for the Heritage basketball team. 2015: Hartsoe Law Firm donated to Legal Aid of East Tennessee (LAET) at a fundraiser at Out of Eden Garden Center to spoort access to legal services in Blount County. 2015: Hartsoe Law Firm made it’s third donation to the Sam Houston Statue fund. Sam Houston grew up in Blount County and had an eventful life in Tennessee and Texas. We look forward to the unveiling of the statue next to the Maryville Municipal Building this Spring. For more information click here. 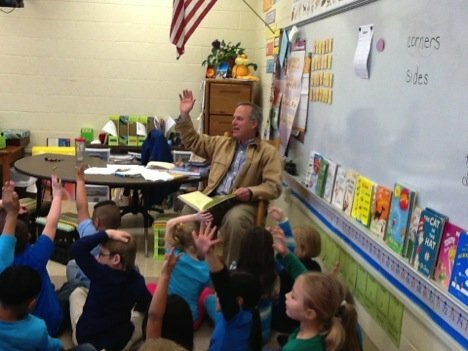 Mark Hartsoe read a book to kindergarteners at Walland Elementary School and brought oatmeal chocolate chip cookies for the students. What a nice group of children. Great fun. Thanks for inviting me. 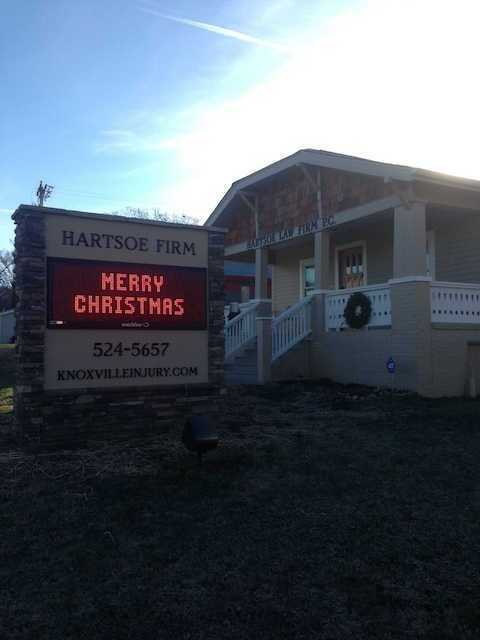 2014: The Hartsoe Law Firm donated $250 to the Maryville High School soccer team to assist them with expenses during the Spring 2014 season. 2014: The Hartsoe Law Firm paid for the transportation costs of renting buses for all of the Walland Elementary School kindergarten classes to ride to the University of Tennessee Agricultural Experiment Station to view the farm and livestock. One child remarked that they like the field trips that don’t cost money. July 2014: The Hartsoe Law Firm is partnering with Smoky Mountain Harley Davidson to raise money for the Sam Houston sculpture to be located in downtown Maryville oin the lawn of the Municipal Building. Sam Houston is a legendary local figure who grew up in Blount County and later became Governor of Tennessee and Texas among many other accomplishments. The fundraiser will be held at the Shed just a few blocks from the law firm and features Hayes Carl with Mike Stinson. Ther Hartsoe Law Firm will donate $5.00 per ticket sold up to $2,500 to assist with this worthwhile cause. October 2014: The Hartsoe Law Firm is sponsoring the second annual Protect and Paddle the Little River to raise awareness and raise money for the Little River Watershed Association. Hartsoe will be partnering with River Sports, Saw Works Brewery, River Johns Outfitters and the Market in Maryville for this special event. Last year’s event had over 125 kayaks and canoes float the Little River. For more information, visit littleriverwatershed.org. KNOXVILLE, Tenn. -- November 18, 2013 -- On Friday morning, the University of Tennessee will unveil a new statue honoring legendary women's basketball coach Pat Summitt. 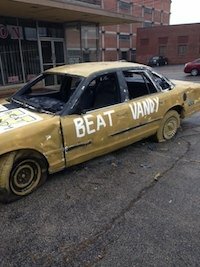 On Friday afternoon at 3 p.m., Knoxville residents and sports fans will raise money for the Pat Summitt Alzheimer's Foundation with an old-fashioned pep rally and charity "car smash" for the Vanderbilt football game. Participants who donate $20 to the Pat Summitt Alzheimer's Foundation get a free t-shirt and two swings with a sledgehammer at a car decorated with Vanderbilt Coach James Franklin's face. 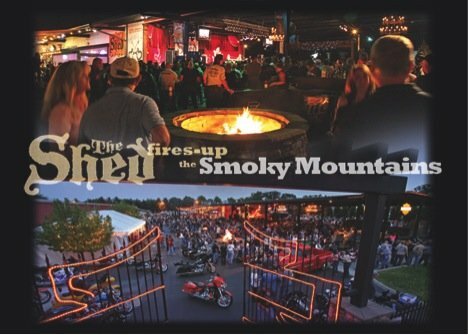 There will be live music and celebrity participants including a variety of former University of Tennessee athletes. The event takes place in front of Saw Works Brewing Company at 708 East Depot Ave. in the Old City (the street will be closed in front of Saw Works during the event). All proceeds from the event, sponsored by The Hartsoe Law Firm and Saw Works Brewing, will go directly to The Pat Summitt Alzheimer's Foundation. In 2011, Summitt announced that after 38 years of coaching and a record that made her the winningest coach in NCAA history for men's and women's sports, she was battling Alzheimer's. Now, Summitt is taking on her latest opponent the same way she has battled opposing teams on the basketball court with her signature game plan. Join the Hartsoe Law Firm and Saw Works Brewing Co. on Friday, November 22 beginning at 3 p.m. at 708 East Depot Avenue in the Old City for "Smash The 'Dores To Beat Alzheimer's" as they raise money for the Patt Summitt Foundation. 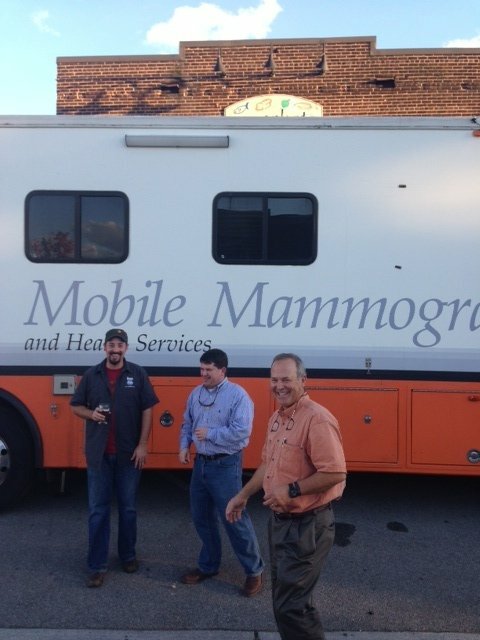 On November 1, 2013, the Hartsoe Law Firm helped raise several thousand dollars for the University of Tennessee Cancer Institute's Mobile Mammography Unit pictured above. The fundraiser, which was held at the Market in Maryville, raised funds for free breast cancer screening. We had a great turnout for this very worthwhile event. Maryville, Tenn. – Proceeds from the first annual Protect & Paddle on the Little River netted over $2,300, which was given to the Little River Watershed Association. Attorney Mark Hartsoe was the original brains behind the fundraiser on September 8, benefitting the conservation and community education group. Last spring, Hartsoe approached Kim Raia, chair of the LRWA, about doing a float down the Little River to raise awareness about the organization’s conservation efforts, and the result was a turnout of nearly 130 people who came out to enjoy a community float trip. Event sponsors included River Sports Outfitters, which provided boats, event registration and t-shirts. The Market at Washington & High and Hartsoe Law Firm provided food, and the beer was provided by Saw Works Brewery in Knoxville. River John’s provided the use of their island. The group float began at Perry’s Mill and ended at River John’s island, where food, beer and music from Sunshine Station was waiting for the guests. The event’s success is a win-win-win for sponsors, paddlers and the Little River Watershed Association. “We’re grateful for the community support, and the support of our sponsors,” said Raia. “The event was memorable, and we look forward to an even bigger turnout in years to come." The mission of the Little River Watershed Association is to foster stewardship and conservation of the Little River and its watershed. More information can be found online at www.littleriverwatershed.org. Left to right: Mark Hartsoe (Hartsoe Law Firm), John Mollish (River John’s Island), Will Sherrod (Saw Works Brewing Co.), Kim Raia (Little River Watershed Association), Mike Adams (The Market at Washington & High), and Laura Jones (River Sports Outfitters). Maryville, Tenn.- When attorney Mark Hartsoe isn’t helping clients in his busy law firm, he’s often enjoying the scenic and natural resources that Blount County has to offer. Whether bicycling along Old Walland Hwy. next to the Little River or paddling his kayak in it, Hartsoe loves the outdoors, and especially loves the natural beauty that this river offers. Last spring he decided he wanted to bring other like-minded outdoor enthusiasts together to have fun in the name a good cause, and he settled on the Little River Watershed Association (LRWA) as the organization he’d most like to promote. Hartsoe approached Kim Raia, chair of the LRWA and, she was delighted to have such a visible and vocal advocate for the organization willing to pull together the sponsors to make it successful. The two determined a way to make it happen and settled on September 8 for the first annual Protect & Paddle the Little River. The September 8 event will begin at 12 pm at Little River John’s island (4134 Cave Mill Rd. in Maryville), where people will park and then get shuttled in a van to Perry’s Mill with either their own boat or one they reserved for $25. The group float trip is expected to last about 3 hrs, ending back at River John’s island, where food, beer and music from Sunshine Station will be waiting for them. Tickets for the event are $35, plus $25 for boat rental if needed. Everyone will need to register online at www.active.com before September 6. The event is rain or shine, and no dogs are permitted. Event sponsors include River Sports Outfitters, which is providing boats and event registration. The Market at Washington & High and Hartsoe Law Firm are providing food, and the beer will be provided by Saw Works Brewery in Knoxville. River John’s is providing the use of their island. “Without support from these sponsors, the event would not happen,” said Hartsoe. “We’re happy to be a part of this first-time event,” said Laura Jones, general manager and buyer at River Sports Outfitters. “Many of our customers rent boats to paddle the Little River, and it’s important to us that we do what we can to help protect it for all to enjoy.” Mike Adams, general manager of the Market at Washington & High said he had worked with LRWA on previous fundraisers. “We like supporting a community organization that not only has the ability to bring people together to have fun, but can also raise participation and awareness about the a local resource that needs the community’s involvement to protect it for the longterm." The mission of the Little River Watershed Association isÂ to foster stewardship and conservation of the Little River and its watershed. More information can be found online at www.littleriverwatershed.com. 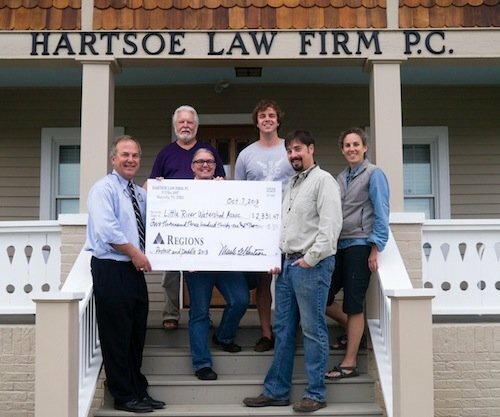 2013 Hartsoe Law Firm donated $2,500 to help Minister Roy Row fund his hike of the entire Appalachian Trail to raise money and awareness for his disability ministry. Rev. Row is the Minister of the Louisville Christian Church, Louisville, TN and a member of the board of Christian Churches Disability Ministries (CCDM). CCDM operates Riverwood, a home for adults with special needs. You can follow Roy as he hikes along the Appalachian Trail at www.ccdmonline.org. Good luck Roy! 2013 PADDLING FOR JUSTICE: Hartsoe Law Firm is sponsoring a canoe trip down the Little River in Blount County on Sunday, September 8, 2013 to raise funds for the Little River Watershed Association www.littleriverwatershed.org, which supports education, monitoring, conservation and other efforts to enhance the quality of the river that provides drinking water and recreation in Blount County. The Little River begins in the Great Smoky Mountains National Park. Hartsoe Law Firm is working with River Sports, the Market in Maryville, SawWorks Brewing Company and other corporate sponsors for this paddling trip that begins in Walland and ends at River John's in Rockford, TN. Mark your calendars and watch for more details! 2013 The Hartsoe Law Fim donated $1,000 to the National Center for Victims of Crime to assist with their mission in helping victims of crime find local assistance and other helpful information. Mr. Hartsoe is a long time member of the National Crime Victim Bar Association. He has recently represented families of victims in three recent shootings, including two against national restaurant chains. In those suits, which were settled after considerable pretrial discovery, it was alleged that the businesses failed to take reasonable action in light of advanced warnings of oncoming violent conduct. 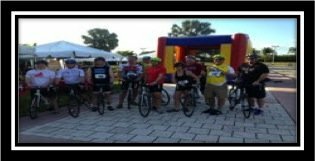 2013 The Hartsoe Law Firm recently donated $200 to the American Diabetes Association and participated in the Wheels for Justice 25 mile bicycle ride in Miami held in conjunction with the American Association for Justice Winter Meeting. Mark Hartsoe was the Tennessee team captain and rode with a large contingent of lawyers from Connecticut, Oregon, Arkansas, Georgia and other states. It was a great fund raising pportunity for a very worthy cause with a group of fun folks. 2013 Last Christmas, the Hartsoe Law Firm donated a shopping cart full of Teddy bears to the Knox County juvenile Court to provide to children who are going through the juvenile court system. Mr. Hartsoe approached the Blount County Juvenile Court and Judge Denton to see whether he would be interested in 100 tiny bears to give to children going through the juvenile court system in Blount County. He also donated another 25 to a local kindergarten class. We’ve never seen such small teddy bears before and have since then given a number to clients, kids and elderly neighbors. 2013 The Hartsoe Law Firm donated $200 to the Maryville High School boys soccer team to assist them with their capital project of installing lights at their new filed at John Sevier Elementary School. Good luck for an enjoyable season. 2012: Blount County Historical Museum: The Hartsoe Law Firm donated $100 to help fund this local history museum located at 1006 E. Lamar Alexander Parkway (next to the Blount County Courthouse). They have very interesting exhibits regarding local historical issues such as the Civil War, local agricultural implements, etc. Visit their website at www.blountcountymuseum.homestead.com or on facebook at blountcounty.historicalmuseum@facebook.com. 2012: The Hartsoe Law Firm donated $100 to assist Whitley McDowell, a graduate of Heritage High School, who is battling brain cancer. The fundraiser was held at Music Row with live gospel and bluegrass featuring Jeff Barbra and Sara Pirkle. Best wishes Whitley. 2012: Lee Horner Memorial Fund: The Hartsoe Law Firm was a hole sponsor at this golf tournament at Laurel Valley Golf Club. The Lee Horner Memorial Fund donates money to worthwhile athletic programs throughout the Blount County area. 2012: “Dimes for Debbie”: The Hartsoe Law Firm donated $75.00 for this walk-a-thon at Walland Elementary School to raise money for breast cancer research. 2012: The Hartsoe Law Firm donated $100 to help the three Kallstrom children whose mother died in a tragic house fire in Townsend after saving the children. Donations can be made to Kallstrom Family Benefit at any branch of U.S. Bank or to Bethel Baptist Church in Townsend. 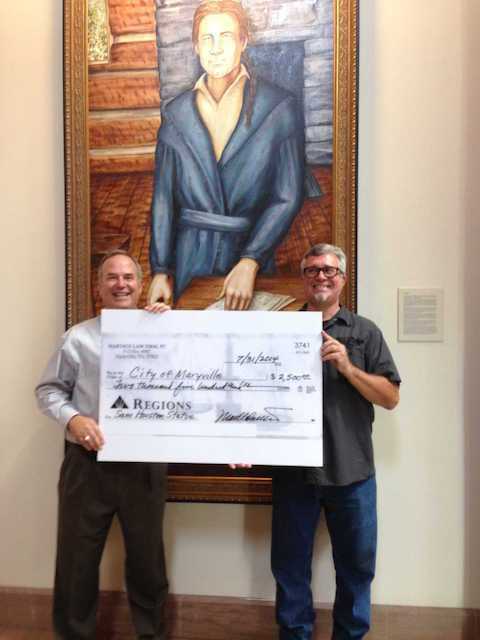 2012: Statue of Sam Houston in downtown Maryville: The Hartsoe Law Firm donated $200 to help fund the Sam Houston statue to be erected in downtown Maryville. A native of Blount County, Houston served as governor of two U.S. states, was president of the Republic of Texas, general; of an army, and served in both the U.S. House and Senate. Donations may be sent to City Recorder c/o City of Maryville, 406 W. Broadway, Maryville, TN 37801. 2012: The Hartsoe Law Firm donated three large bags of new stuffed animals to the Knox County Juvenile Court Stuffed Animal Drive. The stuffed animals are used to comfort children who come before the Court. We didn’t know how much fun it could be loading a shopping cart to the brim with stuffed teddy bears, puppies, kittens, etc. Thanks to Judge Tim Irwin for organizing this very worthwhile event. 2012: The Hartsoe Law Firm donated $200 to the family of Blount County Sherriff’s Deputy and School Resource Officer Sam Tucker to help them with expense as they travel to Vanderbilt for ongoing treatment in his battle against Leukemia. 2012: The Hartsoe Law Building recently had a 30 foot flag pole erected in the front yard of the office to proudly fly a 5 foot by 8 foot American Flag. A flag raising ceremony was held honoring the military service of 83 year old Charles Hartsoe, who is a Korean War veteran, and Bert Paynter, a 93 year old World War II veteran. Thanks to Charlie and Bert for your service as well as all other veterans. God Bless America. 2012: A special thanks to the Market in Maryville for their kindness in sponsoring a Seafood Boil on March 22, 2012 to benefit 3 year old Kylie Overton who is battling incurable brain cancer. The Market donated 100% of every dollar from the event to help this courageous young lady with her dying wish “to go to Disney World before she goes to see Jesus.” The entire staff of the Market pitched in and donated their time and talents and even used their own money for Kylie’s Krew tee-shirts to raise awareness and show support. The Hartsoe Law Firm pitched in $350.00 for this very worthy cause. There was great food and music as the community pulled together to help Kylie. Thanks to Mike Adams, the Market family, the musicians and all who came out for this great event. We hope that Kylie has a wonderful trip to Disney World. 2012: The Hartsoe Law Firm donated $100 to the Rocky Branch Family and Community Education Club which is affiliated with the University of Tennessee Extension Service. The Rocky Branch FCE is involved in community activities such as making lap robes for patients in nursing homes, fixing baskets for the homeless containing food and warm socks, furnishing pencils, paper, crayons, etc. for students who cannot afford them and helping with valentines at a local school. For more information or to join the club, please contact Shirley Abbott at 977-6505. 2012: The Hartsoe Law Firm donated $200 to the Maryville High School Soccer team to assist with the purchase of uniforms and playing field improvement. Managing Partner Mark Hartsoe has a long history of involvement in youth soccer in Knoxville and Blount County. Two sons previously played at Maryville High School and his youngest son is a member of the 2012 squad. 2012: The Hartsoe Law Firm donated $250.00 to help Marine Lance Cpl. Cody Evans of Morristown, TN build a wheelchair accessible home following his severe combat related injury in Afghanistan. Mr. Evans lost both of his legs to a roadside bomb while patrolling with members of Knoxville’s Delta Company of the 4th Engineer Battalion. Additional donations should be sent to 1st Century Bank, P.O. 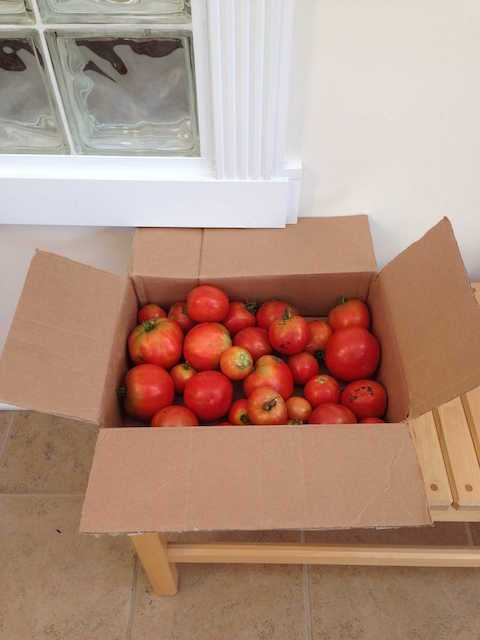 Box 3475, Morristown, TN 37815. 2012: The Hartsoe Law Firm installed 6 solar panels on the Hartsoe Law Building located at 908 West Lamar Alexander Parkway in Maryville, Tennessee. Sustainable Futures of Knoxville designed and installed the solar system which will generate green energy to be returned to the TVA electrical grid. Photos to follow.